The Petit Basset Griffon Vendeen or “PBGV” is one of the cutest members of the large Hound group, but these adorable dogs were bred to be bold in the field after rabbits and hare. The PBGV is a confident, happy and extroverted dog but they are said to be best-suited to an active, experienced dog owner with a well-fenced yard. This dog breed does not fall in the “couch potato” category and they need a lot of exercise. They are also given to baying or being destructive in the house if they aren’t happy. The Petit Basset Griffon Vendeen traces back to the 16th century and to his larger ancestor, the Griffon Vendeen. Petit Basset Griffon Vendeen means “small low-to-the-ground, rough or wire-haired, from Vendeen” – an area in France where these dogs originated. PBGVs are scent hounds and they were developed for the Vendeen area, which had thick underbrush, rocks, thorns and brambles. A dog that was low to the ground with great stamina was needed to hunt rabbit and hare here. The breed’s larger cousin, the Grand Basset Griffon Vendeen, was used to hunt roedeer and wolf. The Small Vendeen Basset is known for being a confident, happy and extroverted dog. They are independent but willing to please. They have been called the “happy breed.” Their tail is always wagging. They are usually very active, lively dogs. They are usually very good with children but they may have too much energy for them at times. They may also play bite if they are not taught that this is inappropriate. PBGVs are also usually good with other pets. However, they may be tempted to chase cats in the home, so it’s best if they are raised together and your PBGV is socialized with your small pets. PBGVs are also prone to howl or sing, so they may not make a good apartment dog. They will often join in with the howling or barking if they hear another dog making noise. You should be very careful when walking your PBGV as they are prone to chasing small animals when they see them. Living Environment – The Petit Basset Griffon Vendeen does not usually make a good apartment dog because of their tendency to bark and howl. They are also very active dogs and require plenty of exercise. Do not let them exercise off-leash since they may chase small animals. If they have their own yard you should check the fence regularly for signs of digging since this breed can be escape artists. Grooming – The PBGV is typically easy to groom. They have a harsh wire coat that needs to be brushed regularly to avoid mats. It should be stripped occasionally to remove dead hair. These dogs don’t shed very much. You should trim the long hair on the bottom of the paws to keep them tidy. The breed is supposed to look clean and tidy but tousled. Diet & Exercise – This small dog breed has normal dietary needs. They do need plenty of daily exercise. They enjoy having their own yard for play. Do not allow this breed to exercise off-leash since they will chase small animals and they likely won’t return when you call them. Health – The Petit Basset Griffon Vendeen can be prone to pupillary membranes, canine hypothyroidism, neck problems (PBGV pain syndrome) and epilepsy. Canine hip dysplasia, luxating patellas (slipped kneecaps), and elbow dysplasia have also been reported. 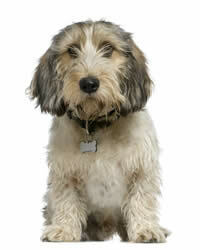 If you are interested in getting a PBGV you should talk to a breeder about possible dog health problems in the breed. The Petit Basset Griffon Vendeen is a very intelligent breed and they do like to please their owners. This helps enormously with dog training. However, you should always remember that this breed has very strong hunting instincts and, when it comes to listening to you or following his instincts, your dog will likely choose his instincts. Nevertheless, good early socialization is necessary so these dogs won’t harm other household pets. They also need good early training in general. Use positive dog training methods (praise, rewards) and they should do well.